Presented on May 8, 2007, by Cathy Warms, PhD ARNP CRRN, in the Department of Rehabilitation Medicine, University of Washington. Read the report or watch the video from this page. Have you always assumed your spinal cord injury prevents you from being able to exercise? Are you interested in learning about different options for increasing fitness after SCI, even if you have tetraplegia (quadriplegia)? Exercise isn’t just about sports or working out, and in this forum video you will learn a variety of options for increasing your physical activity in ways that promote better health and fitness even when movement is limited. Cathy Warms, SCI nurse practitioner and researcher at the UW, discusses the physiological benefits of physical activity for people with SCI and will describe a number of fitness options for persons with different levels of injury. Three individuals with tetraplegia discuss and demonstrate their fitness activities using a variety of techniques, from functional electrical stimulation (FES) cycling to beatboxing (vocal percussion). Presentation time 75 minutes. For a complete list of our videos, click here. Please note : Equipment mentioned in this report is for information purposes only and not an endorsement or recommendation of any specific product. Always check with your physician before starting an exercise program. Resources - Web sites, videos, equipment and more. When we planned this forum, we wanted to present a broader picture of fitness than simply exercise or sports. It's not that those things are not important, because they are and we will discuss them, but the concept of fitness is broader. To become more fit requires knowing how you positively can affect your health and well-being by using your own capabilities to their best advantage. This means that everyone, no matter what the level or completeness of spinal cord injury, can become more fit by choosing to live in a way that will promote health and well-being. So tonight, I will talk about fitness issues and options for becoming more fit, including ways to improve your well-being when you have a higher level of injury. If you're not already in pursuit of fitness, we hope that by the end of the evening, you'll be ready to get started. Although these studies have looked at structured exercise programs, we know that all physical activity provides health benefits. It's not just the exercise sessions that you do or the sports that you play, but it's your total activity level that makes a difference. Your body benefits from just getting out of bed, especially if you're not inclined to do so. What counts as exercise for the individual varies depending on the amount of active muscle. How exercise effects you will depend on your level and completeness of injury. Individuals at all levels can have low blood pressure during and after vigorous exercise, partly due to less efficient return of blood from the legs. But this should not be a barrier to exercise. Not everyone will experience it, and, for those who do, the problem usually can be solved by keeping exercise to moderate intensity, by wearing support hose, ACE wraps, or an abdominal binder. If it's really a problem, there are medications that your healthcare provider can prescribe. People with an injury at T-6 or above are less able to increase their pulse in response to exercise. A maximum heart rate for someone with tetraplegia might be as low as 120 or 130. Because of the variability in heart rate, we emphasize something called the “rate of perceived exertion” (or RPE, discussed below) instead of heart rate to measure how intensely you are exercising. Temperature regulation is another concern. The higher the level of injury, the less able the body is to regulate its temperature, because sweating and other mechanisms of temperature control rely on the autonomic nervous system. For quads, the temperature of the external environment will be the major determinant of body temperature during exercise. So exercising in a cool place, drinking water frequently, and being prepared with a spray bottle and a fan can help prevent any body temperature increase. Upper extremity (shoulder and arm) overuse injury. This can often actually be improved with appropriate regular exercise. But if you already have significant pain or a known upper extremity overuse condition, you should begin your program under the guidance of a PT who is knowledgeable in these problems. Skin breakdown. Pressure sores or abrasions can be caused by improper positioning for the exercise activity or by lack of cushioning. It's important to do a complete skin check when you first start a new activity and make adjustments as needed. Autonomic dysreflexia. While not all that common during exercise, if you're prone to it, and you choose an activity that's irritating to your skin, or if your bowel and bladder are not empty, it could be a problem. Spasticity (high muscle tone). Some types of exercise may worsen spasticity. To avoid this, stretch the spastic muscle groups before exercise and avoid the exercises that tend to exacerbate or cause the spasms. Spinal rods or fusion. Individuals with spinal hardware or a fusion should be cleared for all activities by the spinal surgeon. That's especially true for people who are newly injured and have new spinal fusions or recent surgeries. Medications can change the way your body responds to exercise. Most common medications taken by people with SCI, like Baclofen and other medications for spasticity, as well as bladder and bowel medications, are not going to cause any difficulty. But if you're on medication for high blood pressure or breathing problems, you should definitely check with your healthcare provider before you start exercising. Cardiovascular conditioning (aerobic exercise) is essential for maintaining a healthy heart muscle and for having the endurance to meet daily activity needs. Muscle strength is important for lifting weight and maintaining the balance between muscle groups. Muscle endurance is the ability to lift mild to moderate weight many times. This allows you to perform a pattern of movement for an extended period of time. Stretching for flexibility is important to preserve good motion of the joints with stretching or range of motion exercises to maintain flexibility. Whatever your level or completeness of injury, flexibility exercise should be part of your program. Public health guidelines call for 30 minutes of moderate intensity exercise “most days” (5-7 days/week), keeping in mind that your plan is based on doing “as much as you reliably can” rather than “as much as you possibly can.” Remember, three 10-minute exercise sessions in a day works as well as one 30-minute session. Exercises like wheelchair pushing or arm ergometry provide both cardiovascular conditioning and improve muscle endurance. Aerobic exercise is more difficult with the higher level injury, but not impossible. I read one case study of an individual with C-4 level injury who was able to increase heart rate during shoulder shrugging alone. Functional electrical stimulation (FES) exercise is another option. Physical activity does not have to be strenuous to provide health benefits. Moderate activity, thirty minutes or more daily, on most days of the week is a good goal for everyone. Aerobic exercise requires continuous and rhythmical motion. Cardiovascular fitness cannot be gained in a hurry, and it requires starting slowly with very slow and gradual increases in exercise intensity over a long period of time. The principal of overload applies to aerobic training. You have to work at a level of intensity that's more than that required for daily life in order to become more fit. This doesn't mean exercising strenuously, but doing moderate intensity activities for gradually longer periods of time. Fitness gains without injury are more likely if the duration and frequency are gradually increased, but the intensity is kept at the moderate level. The rating of perceived exertion, or RPE, is an alternative to using heart rate to measure exercise intensity. The numbers on the left of the scale below correspond with the levels of effort described on the right. Ideally, you want to stay between level 3 and 4 when you're working out cardiovascularly. It may take a few exercise sessions before you get a feeling for knowing how hard you're working and knowing the right amount to adjust the exercise routine to increase or decrease intensity. Another way to gauge intensity is that with light intensity, you should be able to sing while you exercise. With moderate intensity, you can talk with someone else while you exercise. But with vigorous or hard intensity, you can't carry on a conversation. It's a good idea to have more than one choice for aerobic activity, because varying activities decreases your chance of injury and usually makes exercise more enjoyable. It also gives you a contingency plan for good days, bad days, high pain days, or high stress days, so that you have choices to fit all of those different conditions. If you're using wheelchair pushing for exercise, you definitely should have alternatives to avoid doing too much of the same thing. 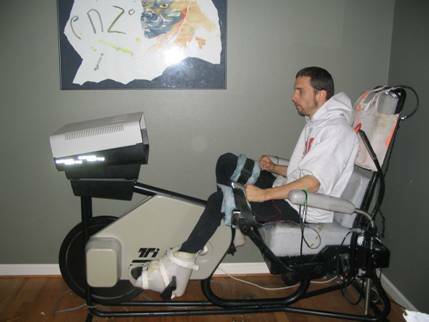 Independent exercise programs are possible for people with C5-C6 tetraplegia using an arm ergometer with pedal adapter or doing wheelchair endurance runs or wheelchair aerobics. Other options may require assistance from others. There is a variety of exercise equipment available for use by persons with disabilities that can be purchased by individuals, clubs or gyms. Circuit training involves cycling through weight lifting and aerobic exercise. Such a program can sustain heart rate and blood pressure so that aerobic benefits can be achieved without steady aerobic activities. Circuit training can also be done at home by setting up an area with strength training equipment and space to do an aerobic activity in between intervals of weight lifting. This can be done for as little as fifty dollars or less using elastic bands hooked to a door or wall for the strengthening exercises and doing arm circling for the aerobic intervals. Other sports and recreational activities providing cardiovascular benefits are swimming, adaptive skiing and hand cycling. There are also many ways to increase your cardiovascular endurance by doing your daily activities in a rhythmic manner and maintaining the effort for at least ten minute sessions. Even doing something like gardening for at least ten minutes at a time will give you fitness benefits. So that's always the goal, ten minute sessions at least three times a day. Functional Electrical Stimulation (FES) involves applying electrical stimulation to the muscles through electrodes placed on the skin. Electrical stimulation of paralyzed or partially paralyzed muscles causes muscle contractions that, with training, can provide functional movement of the limbs. These repetitive motions of the limbs can provide cardiovascular and muscle endurance training. FES technology works only for people with spastic muscles, in other words, those with an injury above the T-12 level. People with cardiac pacemakers cannot use FES due to the potential for electrical interference with the pacemaker. Joint contractures and autonomic dysreflexia can also interfere with successful FES exercise. And FES may be too painful for people with good sensation. There's no doubt about it, FES can be a good way to exercise if you have spinal cord injuries, but it's not available for everyone and can't be used by everyone. 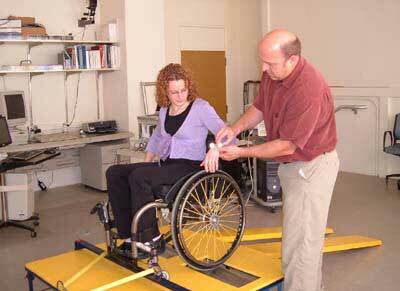 The FES standing or ambulation systems use walkers or parallel bars, or elbow pressures for balance and support. The physical effort of FES-assisted ambulation is six to eight times that of able-bodied walking so that walking speeds are generally low. Set up initial program in consult with PT or personal trainer. Stretch anterior (front) muscles and strengthen posterior (back) muscles of shoulder. Many people with spinal cord injury, especially those in manual wheelchairs, develop muscle tightness in the front of the shoulder due to wheelchair pushing. The muscles in the front become shorter and stronger, while the opposing muscles in the posterior shoulder and upper back become longer and weaker. This imbalance is one of the major contributors to shoulder injury and pain. Optimize seating posture, wheelchair pushing mechanics, and transfer techniques. Weak abdominal muscles and inappropriate wheelchair seating support can lead to poor sitting posture, typically hunching forward with rounded shoulders, and this type of posture can worsen shoulder pain. Good transfer technique and wheelchair pushing mechanics are also important. Avoid frequent reaching and overhead activities. Too much overhead reaching will put stress on the shoulders and could cause injury and pain. Don’t sleep directly on your shoulders. Modify your habits and environment. If you already have shoulder pain, you should take some time to change your habits, adapt your daily activities and modify your environment. The goal is to make your movement pain free but not to stop moving. Exercises like rowing or pole wheeling (using a pole to push your chair instead of pushing the wheels), or wheeling backward, strengthen the back and the posterior shoulder muscles and stretch the front of the shoulders, and will improve shoulder mechanics and reduce pain. Some of these options might require you to go to a gym, or to set up an exercise area in your own house and purchase expensive equipment on your own. Exercise elastic bands and tubing are an effective low-cost resistance training method, and they can provide varying degrees of resistance that can be done almost anywhere. Again, you can also get stronger by making your daily activities a little more difficult, and even by doing some things for yourself that you would normally ask someone else to do. Some strength training equipment manufactured for the general public can be used by people with injury levels as high as C5, although they may not be able to do all of the exercises available on a specific machine. Ideally, you should try the pieces of equipment before you think of buying them, and preferably with a PT available to determine if it's appropriate for you. You can also take a picture to your PT and discuss whether it's appropriate or not. Prices for these types of machines vary from $400 to $2,500, but you might be able to get a really good deal on eBay or Craig's List. Elastic bands and tubing can be purchased with handles that provide a way for those with decreased hand function to use them. They can also be fastened to wheelchairs or doors with loops or clip-ons. People can get really creative and tie them in different ways and fasten them to various places. It's also possible to carry a band with you so you have an instant exercise program to perform during those times when you're waiting for a ride or feeling like you need an activity break in your day. In a research study that I did a couple of years ago, one participant took his exercise band with him on the bus, hooked it up to one of the bars in the bus and did a complete routine during his hour-long commute, then rolled off the bus and went to school. Activity mitts and wrist cuffs can be used to grip weight machines or dumbbells if hand function is limited. Top weights can be used for a variety of exercises. For those who have difficulty with balance and stability, straps and gate belts can aid in proper positioning in a wheelchair. Everyone needs to stretch, and people who have little ability to move need to be stretched regularly and gently. If a joint range is limited, gradual stretching may be achieved over several weeks of low intensity work. Caregivers should be taught how to do range of motion, but don't assume that once they're taught they're good to go, and you no longer have to pay attention. It's your body, and you need to know its limits and requirements and keep track of what your caregiver is doing. Range of motion is a series of exercises in which the extremities are moved within their capacity. Depending on the level of function, some or total assistance may be required. Range of motion is best carried out while lying on a firm surface like a mat table, but it can also be done in bed. A modified version can be done sitting in a wheelchair. An online video about how to do range of motion is on the Rehab Center of Ontario’s Web site at http://www.rehab.on.ca/mobile/rom/index.html. 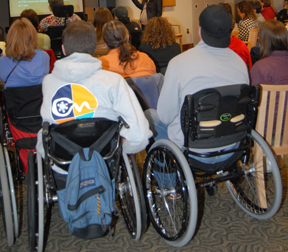 Wheelchair yoga is designed to involve caregivers if necessary, and it's usually done in a group setting. Depending on individual needs, yoga can be practiced in many different positions—sitting, standing, or lying on the floor or on a mat. Poses can be modified, and posture can be supported with blocks, sandbags, blankets and pillows. Resistance to postures is often encountered, but the resistance decreases as the posture is assumed and is well supported. With the eventual stretch or elongation of the muscle, the body accepts a relaxed pose. Yoga is very easy to adapt to differing abilities. Adaptive pilates combines stretch and flexibility using specific exercises that involve concentration, control, movement and coordinated breathing. It often focuses on core muscles, but can also be especially helpful for shoulder and neck muscles. Online you can find adaptive pilates centers existing in various parts of the country. Watsu is a therapy that involves being floated and stretched in the arms of another person in warm water. An online search may help you locate a therapist near you. Weakness of muscles of inspiration (breathing in) and expiration (breathing out): intercostals, diaphragm and abdominals. People with even very high injury levels can improve fitness by doing breathing exercises. Breathing is significantly impaired in quadriplegia because of paralysis of the intercostals (rib muscles) and abdominal muscles, and reduced movement of the diaphragm. There are also varying degrees of breathing problems in people with thoracic or T level injuries due to paralysis of the abdominal muscles. The weakness of those muscles affects lung volumes, cough capacity, and the ability to keep breathing strenuously over time. In long-term spinal cord injury, the rib cage compartment actually may get stiff due to a combination of spasticity and lack of good deep breaths over time. The muscles of inspiration (breathing in, inhaling) work to elevate the ribs and increase the width of the chest, and then the diaphragm lengthens the chest. This creates a negative airspace, and inspiration occurs when air rushes into your lungs. Expiration (breathing out, exhaling) is usually a passive process, but the expiratory muscles become really important when you need to cough, or mobilize secretions. In a person with quadriplegia, only the upper part of the rib cage opens, resulting in shallow breaths. But you don't get those deep breaths, and the reliance on accessory muscles to breathe can lead to fatigue. There are two main types of respiratory muscle training: Inspiratory and expiratory. People with SCI at a cervical level have weakness of both inspiratory and expiratory muscles, and could benefit from those types of training, while those with thoracic level injuries may have more difficulty with expiratory muscles. Breathing exercises may be beneficial in sustaining healthy lung capacity. Establishing a breathing program with ventilatory muscle training can be part of a daily workout plan, and probably should be for those with injury levels above T-6. A recent systematic review concluded that respiratory muscle training is helpful for increasing expiratory muscle strain and vital capacity, but it couldn't determine for certain if it was effective for improving inspiratory muscle strength, muscle endurance, and respiratory complications. More research is required to fully understand the possible benefits. But meanwhile I think there's enough research evidence that most people with SCI should consider respiratory fitness options. There are some new respiratory muscle devices springing up on the market. Many are aimed at singers or marathon runners to gain respiratory efficiency. They offer variable resistance to inspiration or expiration, and they've been shown to improve respiratory effort and coordination. But there are several options that are much more fun. Yoga, which we've already discussed as a flexibility exercise, has a major focus on breathing and breath work. Singing requires learning how to sustain certain notes for a considerable period of time, and to attempt to control the amount of air necessary to complete a line of lyrics. These skills are likely to benefit the respiratory health of people with SCI. Besides the breath control exercise, singing can be enjoyable, give you personal satisfaction and emotional release, and you don't even have to be good at it. Laughter has also been found to improve the efficiency of the respiratory system, and it's been called internal jogging for the major organs. Other benefits of laughter that have been confirmed by research include positive psychological benefits such as increased pain tolerance and improved circulation. GPV, which is the pronounceable term for glossopharyngeal breathing, is a technique for ventilating the lungs unaided by the muscles of respiration. Air is forced into the lungs by the tongue, neck, and mouth muscles. This is a great technique for someone who's ventilator dependent, because it can take the place of vent assisted respiration for a short period of time if there are problems with the ventilator. It's also a good technique for people with higher level of injuries because it maximally inflates the lungs. Respiratory therapists can teach how to do GPV. Time- and labor-intensive, as well as costly. Not always available and must be continued to maintain gains. 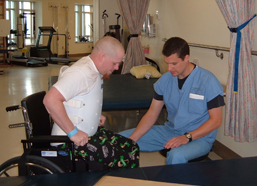 In recent years aggressive physical rehab programs have emerged that seem to restore function in some people with SCI, even years after injury. And there is scientific support that this can be effective in persons with very incomplete injuries. (A discussion of activity-based therapies is beyond the scope of this presentation but is included in the SCI Forum presentation on recovery research, available to view as streaming video at .) There still a need for more research in this area. Activity-based programs can be found in some private clinics or in universities and vary widely. University programs are often research driven, with a goal of publishing papers and getting grant awards, and private clinics are often focused on providing real world results while economically sustaining the program. In my opinion, I hope that some day there will be affordable options, including home based programs, to allow folks who want to spend the time and effort to participate. It's also important that activity based therapies do not become the only life focus, while relationships, career, and family life are put on hold. I hope that part of what you learned tonight is that no matter what is your injury level and functional ability, there are ways for you to increase your fitness. Here are some questions you should ask yourself if you're planning to begin an exercise program, increasing your general activity, or just trying a new activity to increase your fitness. Do I have health problems that need attention before I begin a program? Do I know how to prevent overuse syndromes? Schedule your new activity or exercise to fit into your day or week. Make it your priority rather than something you might do if you have time for it. Timing. Is this the right time in your life to make the change? It needs to be the best time possible so you'll be able to start creating a new habit. Activity. Think about what you can do, what you like to do, and what you're brave enough to try, and then create a menu of options— not just one or two things, but probably three or four is a good idea. Resources. Do you need help, equipment, or encouragement, and how are you going get that? Tracking. Once you get started, keep track. Record what you do, and create benchmark goals, and reward yourself as you meet them. Eric Bryant has C6 SCI and has been using an Ergys brand functional electrical stimulation cycling machine for 16 years. “I ride it about four days a week, thirty minutes a day,” he said. “So, it's a commitment, but it's definitely worth it.” Adding in the time it takes to get in and out of the machine (with assistance), his whole routine takes about one hour total. Bryant dons special cycling pants that have electrodes sewn inside. Computer generated, low-level electrical pulses are transmitted through these electrodes, causing coordinated contractions of the gluteus (buttocks), hamstring (back thigh) and quadriceps (front thigh) muscles that produce the pedaling motion. Bryant reported huge benefits from his exercise regimen. “Right off the bat, I noticed a huge amount of increased range of motion. My circulation has been great, and I've never really had a problem with any kind of skin breakdown.” Other benefits include increased cardiovascular endurance and increased muscle mass in his legs. He also firmly believes that this exercise regimen has improved his immune system, giving him greater resistance to infections, and gives him more energy mentally and physically. These machines are expensive (over $15,000), but Bryant was lucky enough to get it covered by his insurance company. “I've done weight lifting almost since I was about eight or nine years old," Kirk Hennig began. “And the only real hiatus I took was when I got injured.” Not too long after his C6 injury—in fact while he was still in acute rehabilitation at the University of Washington—Hennig returned to weightlifting. “The big difference was, before I got injured I was about 150 lbs. and could bench press 275 lbs. And when I started working out at the UW (during rehab) I could only bench about 5 lbs." Hennig lifts weights daily to keep his shoulders and functional arm muscles strong and balanced, which helps him with reaching and transfers and helps protect him from overuse injuries (he uses a manual wheelchair). He also reports cardiovascular, circulatory and psychological benefits. He needs assistance getting the Velcro-secured cuff weights on his wrists but can remove them by himself. 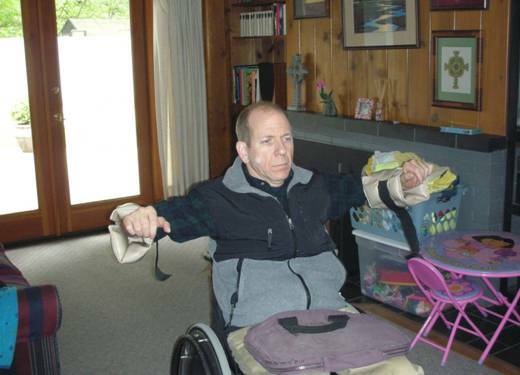 He does some of his exercises lying in bed while an attendant moves his legs in passive range of motion exercises, and others sitting in his wheelchair. Now and then over the years he has had to modify his routine somewhat due to SCI-related complications or injuries, but he continues to be dedicated to keeping as fit as possible. Hennig also uses a standing frame for 15 minutes every day. Todd Stabelfeldt was injured 20 years ago at age eight from a gunshot wound, resulting in complete C-4 tetraplegia. He enjoys singing and beat-boxing and feels he derives respiratory benefits from them. Beat-boxing comes originally from hip-hop music and consists of producing drum beats, rhythm, and musical sounds using one's mouth, lips, tongue and voice. Stabelfeldt gave a brief beat-boxing demonstration (to great applause) which can be viewed on the video. Van Houtte, et al. (2006). Respiratory muscle training in persons with SCI: A systematic review. Respiratory Medicine, 100 (11): 1886-95.